Getting creative and adding your own stamp is the main goal when updating your home’s interior. If you have no idea where to start, then it might be best to think about which room will be used the most, or, tackle your home from the top down. 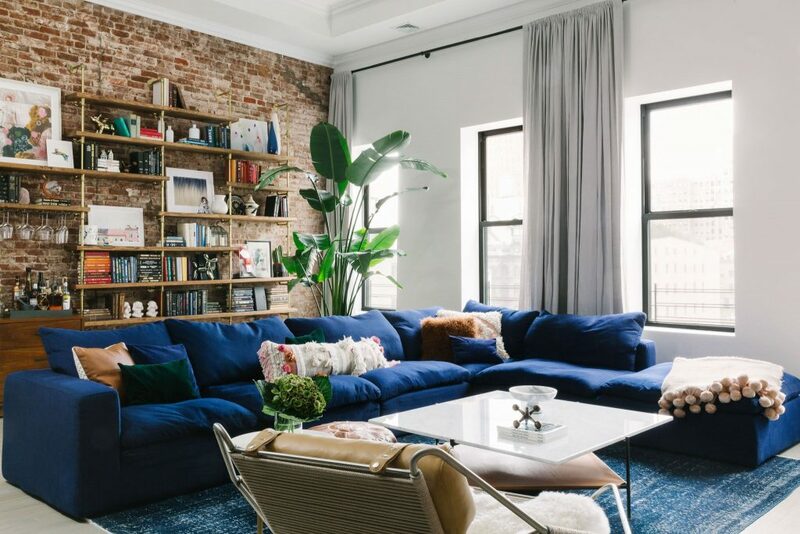 Whether you want to go down the vintage route or make it modern, in this post home interior’s store Time & Tide explore the 10 interior design tips for 2019 that will help you make your house a home. While the majority of people concentrate on upgrading the main rooms in their house, it’s important that you don’t forget about hallways but mostly the entrance. After all, it is the first thing you see on your way in and the last thing you see on your way out – so you want a hallway that makes you feel good about your home. It’s a classic tip, but one that is still just as valid in 2019. The use of mirrors in an entranceway will allow natural light to reflect and fill the room making space look bigger and brighter. Architectural features are set to be big in 2019. Think wood panelling, coving and wainscoting. To finish, accessorise with houseplants to create a calming and therapeutic atmosphere. The most important tip for lighting in your home uses natural light to its full potential. Try not to have anything obstructing windows and doors so the light can flood your home, creating a brighter atmosphere. If you don’t have that much natural light coming in, then get creative with your lighting choices. A stand-alone floor lamp, desk lamp, chandelier, and spot-lights are all great options when choosing lighting for your home, but make sure you use more than one light source to make space feel homely. If you’re really looking to ramp up your home’s lighting in 2019 then suspended and pendulum lights are still set to be popular this year. Better still, get creative with outdoor lighting. This is where you have the most room to get creative and, with an increasing number of amazing solar lights to choose from, there’s now no excuse to leave your garden in the dark. A feature wall can transform any room making it feel like a much bigger space. Using a neutral colour, such as white, cream or grey for the rest of the room and choosing something more vibrant for the feature can create the illusion of a bigger space as the decor is broken up a little. Remember, there’s no need to limit yourself to paints when it comes to the feature wall. Wallpaper, panelling, shelves, art and a collage of photos can all be used to add your own stamp. It’s now popular for houses to be open plan, but this can make it difficult for the purpose of room sections to be defined. In 2019, experiment with your furniture or add new pieces to see if you can create a divide between rooms using carefully selected furniture that still allows for that open plan feel. The positioning of furniture can massively determine the overall look of your room, but before you start, make sure you can still easily get from room to room and that doors are accessible following the move around. If space is tight, use electric tape to tape out the shape of your furniture before placing as this will help you to determine how much space you will be left with. Finish the space with unique home accessories that will showcase your home to its full potential. Don’t be scared to use colour throughout your house and don’t feel like you have to stick to one set colour scheme throughout your entire home. When it comes to interior design ideas, be mindful of which colours you choose. A pop of colour can brighten up a room but you can get creative by combining several complimentary bold colours. If you prefer a neutral colour scheme, then why not try adding some chrome or metallics to break up those softer tones. Using textures throughout your home in the form of cushions and throws can add depth and warmth to each room. Textured wallpaper and wall art can add that focal feature that brings a room together. A statement piece could be anything from a brightly-coloured sofa in a cream room, a bookshelf filled with books that you’ve read throughout your life or even a wine rack filled with vintage bottles of wine. They all make their presence known, giving the room a purpose. Not every room in your home has to go along the same theme or have the same colour scheme. Mix and match throughout your home to add your own personal flare. On the other hand, you can keep one aspect throughout your house by having a splash of colour through cushions or even a rug that links the everything together. Don’t be afraid to go bold and put a stamp on the interior. When it comes to designing a home you often forget about all the little trinkets you’ve collected over the years so it’s good to bear in mind where these items should be displayed. If you have too many to display, then storage is an important design feature to include in every room in some way or another. Whether its a side table in the living area or built in wardrobes in the bedroom, having the right amount of storage can make a house go from cluttered home to show home. Take these tips as a helping hand to spark some inspiration, but the main thing for designing your house is to remember this is your home, and only you can decide which is the right way. Add your own personality and little quirks from floor to ceiling and make it your own little escape. Once you realise the sky’s the limit and remember that you can always re-decorate, the world is your oyster. Transform your home by having a look through our collections and add that extra dash of personal quirk with Time & Tide.